In the 90’s a group of friends from Newbury met in each other’s houses to sing for the love of Singing. We formed a group called ‘Kokopeli’ and sang at various events. A couple of members of the group namely Lara Buxey and kathy McQuillen started a regular singing group at this time too and called it ‘Let’s Sing the World’. The group met fortnightly on Wednesday evenings in the Richard Rooms at St John’s church in Newbury. Sessions were taught by Liz Hodgson, a member of The Natural Voice Practitioners Network, now called the Natural Voice Network (NVN). 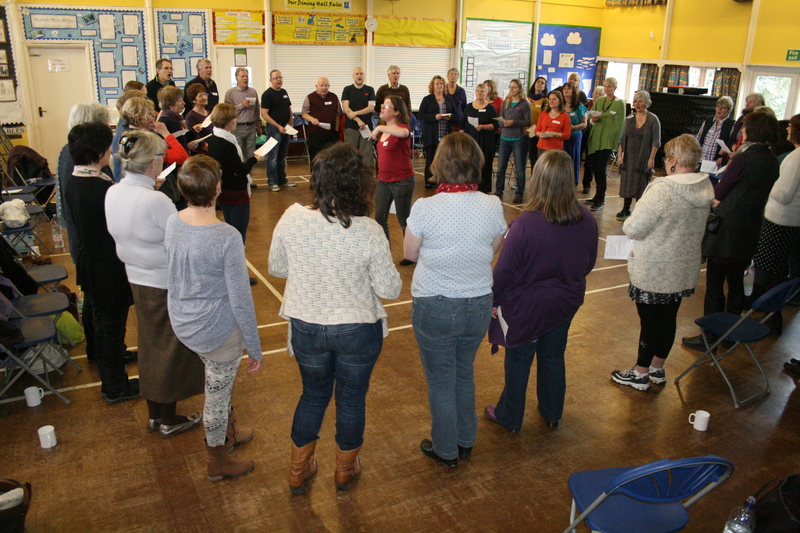 After Liz decided to run her own choir in Oxford, experienced group members started to lead songs themselves on a more informal basis; we had built up a large portfolio of songs by this time. In January 2012, two members of the group; Tessa Hall and Becca Flintham, joined the NVN and started running ‘Sing The World’, a new fortnightly group which meet on a Monday at Speen Parish Hall. This group became weekly in September 2016. It is now run by Tessa Hall. Becca Flintham has moved to Devon and will soon be leading her own choir(s) there. If you click on the link to the NVN website link above, you can find out about the Natural Voice Network and you can also see a list of workshops taking place all over the country (and beyond!) and also find out who teaches where in England.